"CHBD3LE" DOUBLE DOORS AND ARCHED TRANSOM WITH ALL BEVELED GLASS WINDOWS CUSTOM AT GLASS BY DESIGN. 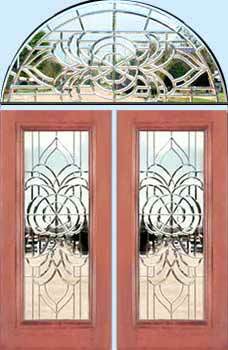 Entry with CHBD3L all–beveled door glass and a custom beveled arched transom. This is clear bevelled glass with no color. The camera sees everything through the clear beveled glass.